Raise your garden to new heights for easier access and greater productivity. Raised beds allow you to overcome poor soil by creating the ideal growing mix, plus make gardening time more comfortable thanks to less bending and kneeling. Whether you purchase a kit or build your own, there are a few things to consider when creating a raised bed garden. Locate the garden in a sunny area if possible. Most plants require at least six hours of sun, and vegetables like tomatoes, peppers and melons produce best with a full day of sunlight. Select a long-lasting material such as interlocking block, fieldstone, plastic lumber or naturally long lasting wood like cedar. The material selected will influence the shape and size of your garden. Some materials allow for curved beds while others are limited to squares, rectangles and other angular shapes. 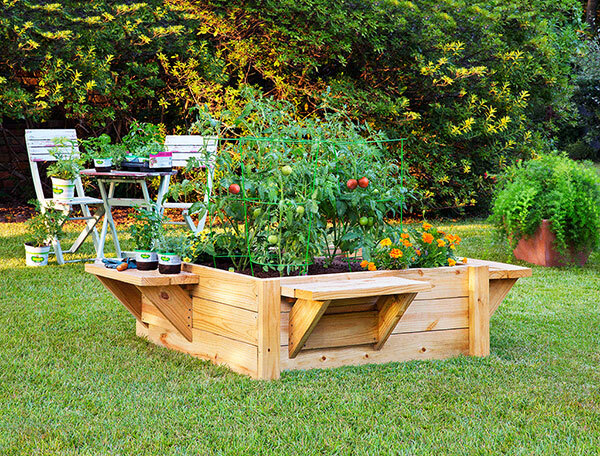 Design your raised bed to fit your space and your needs. A three- or four-feet width makes it easy to reach all parts of the garden for planting, weeding and harvesting. Raising your planting bed at least 8 to 12 inches improves drainage and provides an adequate space for most plants to root and grow. If you want to minimize bending, go higher. Add benches to increase your gardening comfort and ease. Bonnie Plants has free downloadable plans (bonnieplants.com/library) for building a raised bed garden with benches in just one afternoon. Roughen or loosen the existing soil surface if your bed is built on compact, slow-draining soil. This will allow water to readily move from the raised bed into the soil below. Cover the bottom of the bed with newspaper or cardboard, if needed, to suffocate existing weeds and grass. Line the bottom of your raised bed with hardware cloth to reduce the risk of animals burrowing into your garden. Lay the hardware cloth over the ground and bend it up along the inside of the raised bed walls. Fill the bed with a quality growing mix that is well drained but also able to retain moisture and nutrients. This may be a mixture of quality topsoil and compost, a high quality potting mix, or a planting mix designed specifically for raised bed gardens. Grow any plants that you normally would grow in ground. Just make sure the plants are suited to the growing conditions (such as sunlight, heat and wind) in your area. Since the soil mix and drainage is ideal in a raised garden, you will be able to grow more plants per square foot. Just be sure to leave sufficient room for plants to reach their mature size. Keep your plants healthy and productive with proper watering. This is critical for growing any garden, but even more crucial in a fast-draining raised bed. The simple act of raising the garden height increases drainage, and a raised bed filled with planting mix means more frequent watering. Consider using drip irrigation or soaker hoses for watering ease. Always water thoroughly when the top inch of soil is dry. Add some mulch to help reduce watering and the need for other garden maintenance. Spread a layer of evergreen needles, pine straw, shredded leaves or other organic matter over the soil surface. This helps conserve moisture, suppresses weeds and adds nutrients to the soil as it decomposes. You’ll spend less time watering and weeding throughout the season. Add an organic fertilizer at planting if your planting mix does not already contain one. Apply again mid-season if the plants need a nutrient boost. Always follow the label directions on the fertilizer container. The time and effort invested in creating raised beds will be returned many times over with years of healthy and productive gardens. Gardening expert Melinda Myers has written over 20 gardening books, including Small Space Gardening and the Midwest Gardener’s Handbook. She hosts The Great Courses “How to Grow Anything: Food Gardening For Everyone” DVD set and the nationally syndicated Melinda’s Garden Moment TV & radio segments. Myers is also a columnist and contributing editor for Birds & Blooms magazine and was commissioned by Bonnie Plants for her expertise to write this article. Myers’ website is www.melindamyers.com.